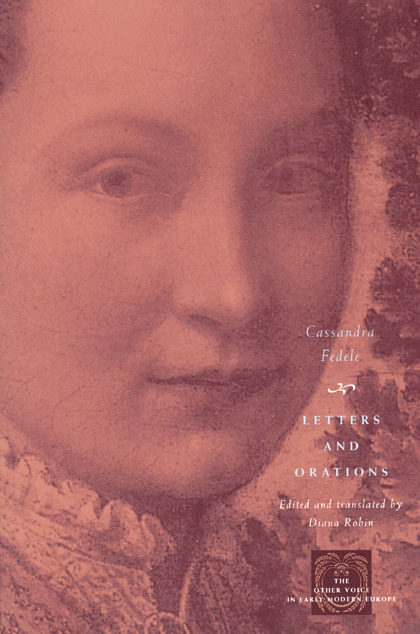 By the end of the fifteenth century, Cassandra Fedele (1465-1558), a learned middle-class woman of Venice, was arguably the most famous woman writer and scholar in Europe. A cultural icon in her own time, she regularly corresponded with the king of France, lords of Milan and Naples, the Borgia pope Alexander VI, and even maintained a ten-year epistolary exchange with Queen Isabella and King Ferdinand of Spain that resulted in an invitation for her to join their court. Fedele’s letters reveal the central, mediating role she occupied in a community of scholars otherwise inaccessible to women. Her unique admittance into this community is also highlighted by her presence as the first independent woman writer in Italy to speak publicly and, more importantly, the first to address philosophical, political, and moral issues in her own voice. Her three public orations and almost all of her letters, translated into English, are presented here for the first time. Introduction to the Series by Margaret L. King and Albert Rabil, Jr.